Jack Wilcox was a professional poker player from Reading, UK. He was a successful $400NL and $600NL 6max NLHE player. He took shots at $1,000NL (mostly when the fish were around), as well as occasionally playing PLO. 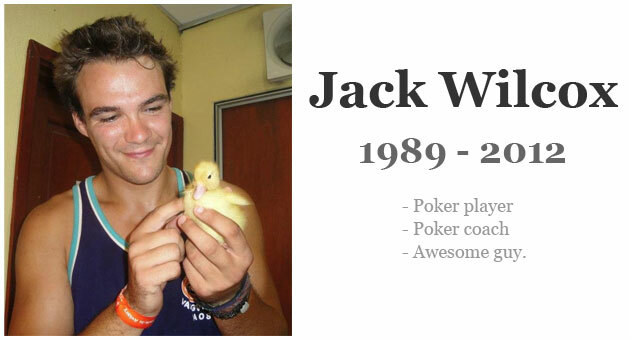 Jack moved to Thailand with a group of other online poker players to for an extended holiday in early 2012. He died in a motorcycle accident on the 6th of February 2012, less than 3 weeks after arriving. He was 22 years old. However, since he started playing poker in 2009, Jack has helped a lot of people to become better at poker. He was active on the 2+2 forums, and also spent time chatting with and coaching players via instant messenger. He started his own training site aimed at micro-stakes players. He also wrote a bunch of strategy articles and made training videos too – for free. This page is here as a resource for links to all of his selflessly helpful work. We'll never know what great work he would have gone on to create, so we'll just have to settle for the amazing stuff he did leave us with. Even though Jack is no longer with us, his work will continue to make a difference. His talent for teaching deserves to be benefited from for years to come, so here you go. Note: Is Jack's strategy and advice any good? Jack Wilcox earnings graph for $200NL and $400NL over 450,000 hands. Jack Wilcox ("Hoodlincs" at Full Tilt Poker) results according to PokerTableRatings.com. And you know how some people are good at explaining stuff? Yeah, that's Jack as well. Enjoy. HigherLevelPoker.com is the micro-stakes training site that Jack founded. Note: There are a few "Part 1"s and "Part 1/2"s without their sequels. I don't believe I've missed the other parts, I just don't think Jack had chance to finish them. I decided to keep the original titles as they are. 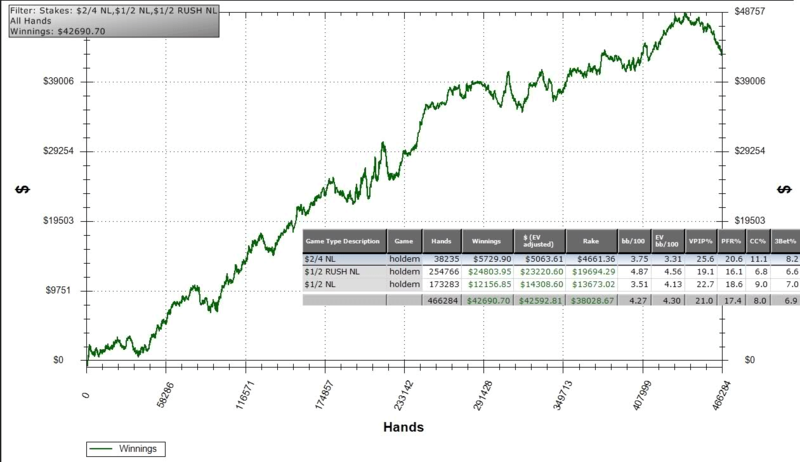 NL10 - NL 200 Experiment 2+2 Forum Thread Jack's plan was to move from $10NL to $200NL and document his progress. But he basically ended up giving advice for 57 pages. Math Post: How to calculate the EV of a play 2+2 Forum Thread How to calculate expected value, Jack Wilcox style. Posted in the beginners forum, but quite a complex example using a preflop 4bet/call spot with JJ in the CO.
Should a beginner play SNGs or cash games? 2+2 Forum Thread Self-explanatory. Jack weighs up the two games and analyses the profit potential of both. Understanding relative hand strength 2+2 Forum Thread Explanation and example of relative hand strength. I'm Greg, the guy behind this site. I was genuinely fortunate enough to know Jack in person. That's a cliché, but I don't care. It's true. It annoys me that everyone speaks so highly of people when they pass away, because it it takes weight away from what I'm going to say about Jack. Jack was awesome, and it's not his death that makes him that way. We weren't bestest buddies or anything. We just did some work together, lived nearby, and chatted every time we saw each other. But that was enough. That was enough to know the kind of man Jack was. It was always enjoyable to bump in to him – you never had to think of anything to say because he had that covered for you. He always had something interesting for both of us to talk about. As hard as I may have tried, I couldn't have an awkward conversation with him. I regret not getting to know him more than I did, because he would have made a damn good friend. I missed out there. We were kinda neighbours for a while. I'm sure he saw me walking around my flat naked – on more than one occasion. Sorry about that, Jack. We both started at Swansea University in 2007. We weren't on the same course (Jack = Business, Me = Physics), but I came to meet him through my girlfriend who was also on the same course as him. I heard he was the president of the poker society, but I just assumed he was just an average live player with limited skill. Didn't take long to do a quick browse around his posts at 2+2 to learn that he was actually much better than I was/am. So impressive in fact I felt a little inferior. His grammar in forum posts is atrocious though, so that made me feel a bit better. Still, he always knew what he was talking about when it came to strategy. Anyway, where I had dropped out after just 1 year, Jack went on to juggle both online poker and University, earning a 2:2 Bsc Business Management in 2010. My girlfriend was graduating at the same time as him, so it was cool to be there to see him pick up his degree. So what was Jack really like? I'll admit, good looking. He was as good looking in real life as he is in photos. Tall as well. So yeah, overall genetically attractive. I think I'll have to leave it there though as my girlfriend will be reading this. He did what he liked. Not in an obnoxious way though. He just put his ideas in to motion without worrying about what other people may think. One of those people. That's about as much as I know. Again, I didn't know him amazingly well, but I knew him well enough to know all that. I'm an excellent judge of character, and I could judge that Jack's character was excellent. The more I think about Jack the more I realise what a loss to the human race he is. He had selfless ideas and goals, and it hurts to think about what we'll be missing out on. The last big plan of his that I remember involved setting up a hostel for young people travelling to Swansea. I noticed he started dabbling in making poker training videos for the 2+2 community in mid 2009 (in his NL 10 - NL 200 Experiment thread), so I took advantage of this by asking if he'd like to make some training videos for ThePokerBank. Being Jack and loving the idea to help even more people, he obliged. He asked for so little in return for videos he was essentially making them for free. It must have worked out to less than minimum wage. As I keep saying, Jack really just loved to teach, and he loved to help. Jack's First Video: I can't find a copy of the first video Jack made for 2+2. Here's the post on 2+2 about it, but it was uploaded to MegaUpload so I can't re-download it. If you've got it, can you let me know at greg [at] thepokerbank.com? That would be amazing to find. Jack Wilcox 1 was the first video he made for this site. I was happy that he charged so little, as the audio wasn't great (just technical teething problems) and needing some fixing. But as expected, the content was (and always will be) typical Jack Wilcox quality. Easy to follow and easy to learn from. He was a natural teacher. I wish I could have squeezed more videos and articles out of him, but he had plans of his own. I've not written anything like this before, so I'm not sure how this part goes. I think I'm supposed to finish with a lingering sad thought or memory. Whatever. I can do better than that. Instead, click this link (not yet, in a sec). That link will take you back to the top of this page, back to Jack's anthology. Watch, listen to and read all the great advice, and use it to become a better poker player. That's why Jack made it all, and that's what it will do if you take his advice onboard. Another insight in to how cool Jack was. If you're not familiar with the world of online poker, you won't grasp the gravity of these 5 simple comments. Poker involves trying to win money from other people, and understandably not everyone enjoys being on the losing end of this process. As a result, abusive comments about other players are standard. It's kinda like trying to make friends in the comments section of a video about religion on YouTube. So to see such comments like "Came to my table, asked to 3-4 table and when I wasn't up to it, replied very polite. Seems solid" isn't just a pleasant surprise, it's incredible. And no, no comments have been removed or edited since his death to make the page look better. I know this because I checked up on Jack's stats myself from time to time, and nothing has altered. More tributes to Jack Wilcox. Have I missed anything? Send me an email at greg [at] thepokerbank.com and I'll add it to this page.